Our Viennese bed&breakfast is conveniently located in a quiet side street, in the heart of Vienna. Our exact address is Ebendorferstraße 10. We are two minutes from the cityhall (Rathaus) and the main building of the Vienna University. From our place all important monuments are either in walking distance, or can be reached with public transport. Below you find a digital map with our location. If you need public transport, we are just 5 minutes away from the underground stations “Rathaus” and “Schottentor”, where you also find a number of tram lines. By the way, the city map on top is from around 1830 and a little bit out of date. 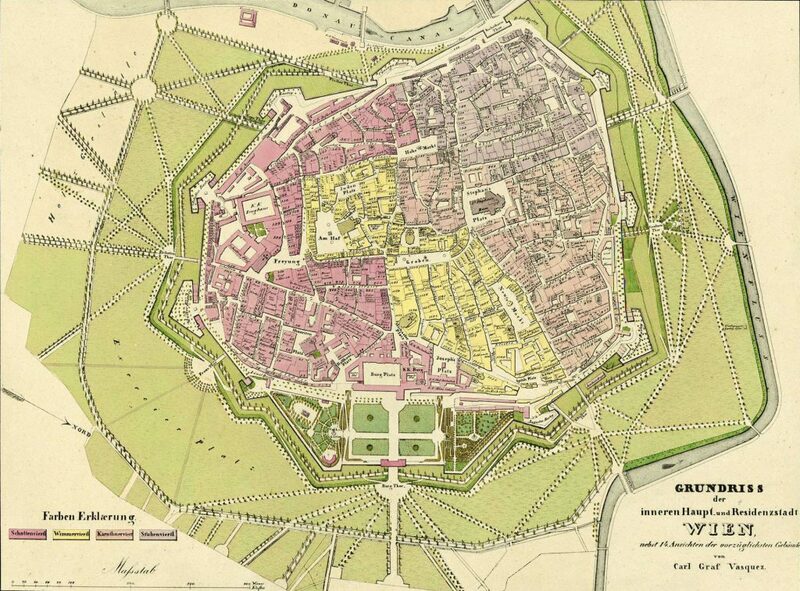 At that time the center of Vienna was surrounded by a city wall. The city wall has been replaced with a boulevard, the “Ringstraße” (ring street). Fortunately we are only 5 minutes from the ring street. Once you have arrived after a hopefully relaxing flight at the Vienna Airport, you can go by train “S7”, until you arrive at station “Praterstern”. Please make sure you are going in the direction of Vienna. Once you have arrived at “Praterstern”, you can go by underground line “U2” (purple line), direction “Karlsplatz”, until you arrive at station “Rathaus”. From there you can walk to us in around 5 minutes. Please note that the trains are only running until around 11pm. If you are going to arrive later, you can go by one of the Taxis that are available at the airport at all times of the day. The fare is around EUR 40,- from the airport to our place. Once you have arrived after a hopefully relaxing journey at the central railroad station (Hauptbahnhof), you can take the tram line “D”, direction “Nußdorf”, until station “Rathaus”. From there you can walk to us in around 5 minutes. Alternatively you can go by underground from the central railroad station (Haupbahnhof). First you need to go by underground line U1 (red line), direction “Leopoldau”. Once you arrived at station “Karlsplatz”, you need to change to underground line U2 (purple line), direction “Seestadt” and go with it until you arrive at station “Rathaus”. Again it’s only a few minutes waling distance from there. Copyright © 2019 Residenz English. All Rights Reserved.